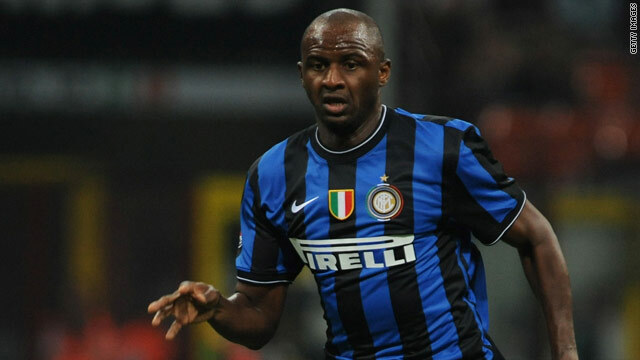 Patrick Vieira has become Roberto Mancini's first signing as Manchester City manager, joining on a six-month contract. (CNN) -- Roberto Mancini has completed his first transfer as Manchester City manager after sealing the signing of Inter Milan midfielder Patrick Vieira on a six-month contract -- with an option of a further 12 months to follow. French international Vieira, who played under Mancini at the San Siro, played his final match for the Serie A champions on Wednesday, a 1-0 victory at Chievo, before flying to England on Thursday for his medical with the Premier League big-spenders. The 33-year-old former Arsenal captain, who won three league titles during a successful nine years with the London club, will wear the No.24 shirt for his new club. Mancini told City's official Web site: "Patrick is a world class midfielder with a winner's mentality and will fit in very well. "He knows me and my staff well, and importantly he also knows what the Premier League is all about. He will not need much time to settle. "Patrick is one of the great players of his era with almost every honor in the game against his name. I am sure City fans will welcome him warmly and appreciate the contribution he will make." Patrick is one of the great players of his era with almost every honor in the game against his name. Vieira begun his career with Cannes and then played briefly at AC Milan before making 279 appearances for Arsene Wenger's Arsenal side -- captaining the 'Ivincibles' side that went unbeaten throughout the entire 2003-04 season. He left Arsenal after helping them lift the 2005 FA Cup final against Manchester United -- scoring the decisive penalty in the shoot-out. In Italy with Juventus and Inter he won four league titles (one of which was taken away from Juve), and two Italian Super Cups. Vieira has 107 France caps to his name, having won both the World Cup in 1998 and European Championships in 2000. Meanwhile, in other transfer news, Liverpool defender Andrea Dossena has ended an unhapy 18-month spell in the English Premier League by returning to Italy to sign for Serie A side Napoli. The 28-year-old former Udinese defender has signed a four-year contract for a fee of 4.45m euros. Dossena is likely to be joined out of the Anfield exit door by Ukrainian striker Andrei Voronin, who is poised to complete a two million euros move to Russian side Dinamo Moscow over the weekend. Elsewhere, Premier League side Birmingham City have swooped for Spanish midfielder Michel from Sporting Gijon for a fee of 3.5 million euros, while Atletico Madrid have signed Juventus midfielder Tiago on loan for the rest of the season with a view to a permanent deal. Why have Manchester City signed Vieira?